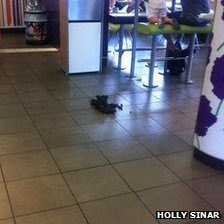 LONDON: A woman has been fined for taking her horse into a McDonald's restaurant in Greater Manchester. The woman then led the animal inside, where it "ended up doing his business on the floor", a Greater Manchester Police (GMP) spokesman said. McDonald's said it was unable to serve customers on horseback. 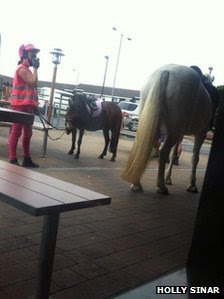 A girl riding a pony also went through the McDonald's 'drive-thru' with the woman. A spokeswoman for the company said: "On 20 July a woman allowed her pony to enter our restaurant in Whitefield after being refused service in the drive-thru lane. "The incident caused distress to customers and disruption for the restaurant, and the police issued the woman with a fixed penalty notice." She added: "The health and safety of our customers and staff is our top priority, and for this reason we are unable to serve pedestrians, bicycle riders or customers on horseback through the drive-thru." Greater Manchester Police said: "The sight and smell of this caused obvious distress and upset to customers trying to eat, as well as staff members. "Officers arrived at the location and the woman was issued [with] a fixed penalty notice for causing alarm and distress to other customers and staff."